An active Horse woman breathes life full of chest, eagerly interested in everything that happens around. However, the fan will not have to suffer alone, trying in vain to attract her attention. The energy of this amazing person is more than enough for personal affairs, and for relationships with the beloved. According to the Chinese horoscope, the Horse is a passionate, self-willed person who does not recognize the boundaries and boundaries. In love, she manifests herself as a temperamental woman, with pleasure she plunges into the world of pleasures. To charm and charm this bright, cheerful person is not at all difficult, she herself is drawn to communication. A loving Horse woman easily enters into a relationship, though it stops as quickly and without regret. Hot and passionately expresses her love, but no less vigorously gets rid of a bored partner. This is an honest woman, not in her rules to deceive people. Never agree to a relationship built on benefits, not love. Romantic, temperamental Horse wants to find happiness with a worthy man. An intimate horoscope contains quite contradictory information about women of this sign. Some of them differ modesty, shyness. Experiencing embarrassment in bed, can only open in the hands of a beloved man. Others — they enjoy a great deal of intimacy, especially with an experienced lover, show miracles of emancipation in bed. Undoubtedly one thing: they are temperamental women, who have a lot of virtues. In bed, the Horse woman seeks to have fun, therefore easily assumes the role of leader. Of course, if the lover is not against her activity. 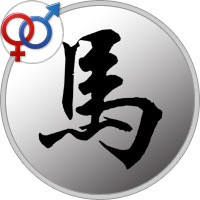 But in a relationship with an equal partner does not consider it shameful to yield, readily recognizes her superiority. The hot nature of the Horse craves bold caresses, she will not enjoy the indecisive actions of a timid lover. An energetic woman will find a way out of this delicate situation. However, with such a passive and unskillful partner, she will continue to relate only if she is very enthusiastic about it. The freedom-loving woman will never accept violence in any of its forms. Therefore, too rough petting lover will cause in her only rejection, but not pleasure. A Horse woman in bed knows how to give herself away without rest, she counts on such an attitude from her lover. Can make happy any man, but only with skillful treatment. A quick-tempered woman is too quick to kill, so she can easily part with her lover, unable to please her. Especially if his actions cause pain, cause discomfort. A passionate Horse woman is supportive of her fans, although she can be quick-tempered and stubborn. She likes sensual, hot caresses, but only from a really beloved partner. If she realizes that she made a mistake with choosing a lover, she will leave without regret. However, a man with a modest love experience, which evokes in her violent emotions, can count on a long relationship. With pleasure, she will take up his studies, at the same time, and rid himself of sexual complexes and fears. In a romantic relationship, a Horse woman expects from a man knightly deeds. She is pleased to feel like a precious treasure, the possession of which gives her lover happiness. Especially if it concerns a modest and timid representative of this sign. She will surely gain confidence in herself, she will understand the charm of sensual pleasures, though it will take a little time. Usually, women-horses are characterized by an ardent temperament, men can only reveal and multiply their talents. Love relationship with a woman-horse is sure to bring you happiness, you need only respect for this emotional person. She is not inclined to hysterics and moods, she does not put forward unrealistic demands, she is simply impulsive and naturally impulsive. It can sharply push you away, if you doubt the reciprocity. Therefore, be patient and understanding, do not lose good mood, come up with new ways to diversify your love game. She likes active, energetic men who have a rich imagination. A temperamental Horse woman is not capable of restraining her jealousy. This is a sure sign of how strongly she is attached to you. Splashes of rage hot-tempered The horses seem sweet and funny, they make variety in the relationship. However, do not think to suspect and check your mistress. Your jealousy, she considers disrespectful to yourself. Therefore, try to inflame her passion with her skillful caresses, and by clarifying the relationship you will only achieve separation. The freedom-loving Horse woman does not take control, acts as her conscience tells her. Especially her conscience is always clean. Most Important: How to Seduce a Horse Woman? For a woman-horse material prosperity and high social position do not play a big role. Of course, she is pleased to see next to a respectable admirer, but it is desirable that he was also a romantic. Attention this woman will be able to attract a vigorous, active man, capable of original actions. You must be not only a bright person, but also look great. She is not interested in the untidy, abusive man who abuses bad habits. A Horse loves beauty in all its forms, so try to keep an eye on your appearance. A Horse woman likes change, she leads an active lifestyle. You can invite her to a Horse ride or offer a ride on bicycles. The refusal, most likely, will not follow, will not become jealous and depict a high-society person. I am pleased to accept the idea of ​​going on an excursion to some particularly wonderful place. But a standard dinner in a restaurant with candles will cause her boredom. Although it can be an elite institution by the river or with a panoramic view of the city. In this case, the Horse woman will have a pleasant time in a beautiful place, she loves new experiences.